Most people enjoy seeing butterflies. Why not encourage them to not only visit your yard for nectar, but to also breed and reproduce in your yard. Butterflies go through four stages of life - egg, caterpillar or larva, pupa or chrysalis, and adult. Planting nectar plants in your garden will attract the adults, but we need to also grow the necessary food plants for the larva. 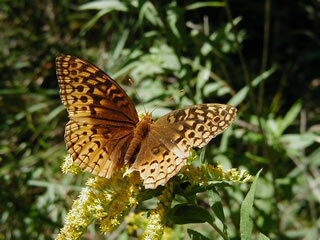 In selecting food and nectar plants for butterflies, it's best to use native plants of our region. Most peoples yards are made up of fescue lawn, which has little benefit to any wildlife. Why not eliminate part of your lawn and replace it with native plants. The butterflies evolved with these native plants, so it only makes sense to use them to benefit the butterflies and in the process attract them to your yard. We should mirror the natural environment to attract butterflies. In the end you will end up attracting more than butterflies. You will also get birds, bees, and beetles - and a host of other creatures. Before I became interested in butterflies, I was a native plant aficionado. I incorporated hundreds of native plant species into my landscape in Topeka, Kansas. I created woodland, wetland, and grassland areas. 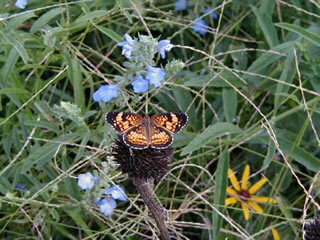 I have researched many butterfly species native to Kansas to determine their favorite larval food plants. I will share with you what I have encountered in my own yard, and what I recommend for yours. Probably the most well known butterfly is the monarch, and the monarch's choice of larval food is plants in the milkweed family. When people hear milkweed, most think of common milkweed - it's the most abundant and weediest of the species. In my part of the state there are many native milkweeds. All our milkweeds are in the genus Asclepias, except for milk vine - it is the genus Cynanchum. I have the following milkweeds growing in my yard - antelope horn A. viridis), swamp (A. incarnata), smooth (A. sullivanti), whorled (A. verticillata), green (A. viridiflora), narrow leaved (A. stenophylla), butterfly (A. tuberosa), purple (A. purpurascens), common (A. syriaca), and milk vine (Cynanchum laeve). All the milkweeds like full sun, except for purple which also does well in partial sun. Swamp prefers moist soil, while the rest prefer dry to medium soil. I recommend growing several species, because the monarchs seem to be attracted to different species throughout the season. 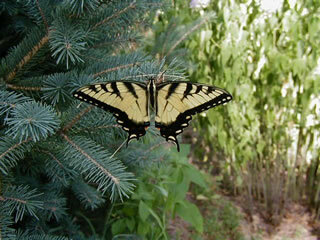 Different species bloom at different times, which will attract the largest variety of butterflies. This may be due to fact that the egg laying monarchs may prefer one species early in the season, and others later in the season due to the tenderness of the leaves. 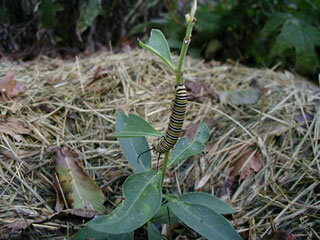 The larva use the leaves of the plant for food, while the adults use the flowers for nectar. 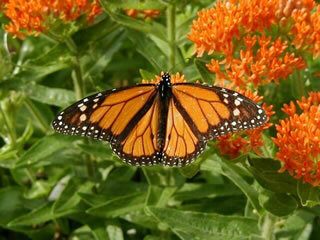 And not only monarchs are attracted to the flowers, but so are other species of butterflies, moths, bees, and wasps. From my observations, the larva seem to like the smooth leaved species best - Swamp, Smooth, Whorled, Purple, and Milk vine. The giant swallowtail has only one larval plant in northeast Kansas - the Prickly ash. It's actually not an ash, but a member of the citrus family. 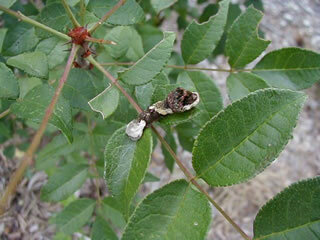 When I first discovered the giant swallowtail larva in my yard, I thought it was bird poop on the leaf. I tried to brush it off and it was ALIVE. Within the next weeks I noticed more larva - the plants were covered with 30 or more giant swallowtail larva. I think everyone needs a few prickly ash plants in their yard. They will grow in partial shade, but do better in full sun. Because they sucker (new individuals sprout from the roots), it's easy to get new plants. Find a colony of them, and use the smaller "suckers" to start your own colony. They can be transplanted as long as they are dormant. 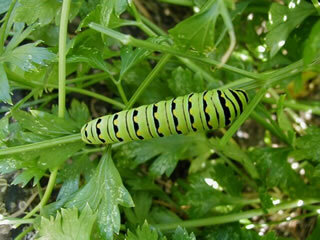 The black swallowtail uses plants in the parsley family for larval food. In your garden this includes carrots, parsnips, parsley, and dill - all annuals and biennials. For native plants this includes Golden Alexander's and Prairie Parsley - both of which are perennials. This is probably the easiest swallowtail to attract because of its abundance and because its food plants are in most peoples gardens. I've seen dozens of the larvae on my parsnip plants. It's cool to watch how they change day by day. The zebra swallowtail only uses the Paw Paw tree for its larval food. Paw Paws make beautiful landscape trees and will grow in the shade of other trees. They cannot be transplanted so must be grown from seed. Paw Paw's grow in full sun, but also tolerate shade. I haven't seen Zebra Swallowtail larvae on my Paw Paw's but have noticed another butterfly using them - they curl the leaf around themselves. I believe it was the leaf curler moth larva. Let's talk about the best nectar plants for attracting butterflies. I already mentioned the milkweed and its benefit as a nectar plant. Another very important nectar plant is the gayfeather. It is in the genus Liatris. I have Thickspike (L. pychnostachya), Button (L. aspera), Dotted (L. punctata), Narrow-leaf (L. mucronata), and Scaley ( L. squarrosa). They all bloom at different times and are big butterfly attractants. When the Thickspike gayfeathers were blooming, I always saw a few swallowtails feeding on them. They are some of the showiest flowers with their purple blooms. The Joe pye is in the genus Eupatorium. It includes Sweet Joe Pye (E. purpureum), Common Boneset (E. perfoliatum), Tall Boneset (E. altissimum), and White Snakeroot (E. rugosum). Sweet Joe and White snakeroot prefer partial sun, while Tall Boneset and Common Boneset like sun. Common Boneset needs moist soil also. Butterflies love these species, and I will never forget the site of three Tiger swallow tails feeding on the Sweet Joe Pye. I think it was their favorite nectar flower. The famous genus Echinacea contains the purple coneflowers. Kansas claims three species Pale Purple Coneflower (E. pallida), Topeka Purple Coneflower (E. atrorubens), and Black Sampson (E. angustifolia). Not only do butterflies love feeding on these, but I've seen hummingbirds at the Pale Purple Coneflower. There is some species of butterfly that used my Echinaceas as larval food plants. I am guessing that they were the Checkerspot's larva - as they love various species in the Aster family. The Rudbeckia genus is also commonly known as coneflowers or as Blackeyed Susans. It contains the following Kansas species: Blackeyed Susan (R. hirta), Cutleaf Coneflower (R. lanciniata), Sweet Coneflower (R. subtomentosa), and Browneyed Susan (R. trilobia). These species all bloom profusely and butterflies love them. Their flower color is yellow and they all do well in partial sun. This is a bonus, because full sun can be a hard thing to find in a tree filled yard. The Rudbeckias bloom profusely and the butterflies love that quality. Goldenrod's are quite common and are in the genus Solidago. I recommend growing many species because they come in so many different forms and bloom at different times of the season. I have the following Kansas species in my garden: Canada (S. canadensis), Giant (S. gigantea), Missouri (S. missouriensis), Gray (S. nemoralis), Downy (S. petiolaris), Stiff (S. rigida), Showywand (S. speciosa), and Elmleaf (S. ulmifolia). The Canada and Giant species are quite aggressive, so only use them if they have plenty of competition from grass. Not only do I notice butterflies on the goldenrod, but there is some species of wasp-like insect that goes wild for the goldenrod. Some people think goldenrods cause hay fever, which is incorrect. Hay fever is caused by wind pollinated plants like grasses, oaks, and ragweed. A majority of our native prairie wildflowers bloom in the fall and this is the time when the butterfly populations are at their largest. It's just another reason to use native flowers in your butterfly garden. Don't be surprised if you attract a lot of native birds also to your "butterfly garden". They love the seeds of many wildflowers and the fruits of many of the woody species. Plus the birds will eat some of the butterfly larvae. There are some species of butterflies and moths that do not nectar on flowers but instead are attracted to rotting fruit, sap, or even dung. To attract these species a bait can be used. Mis all ingredients and store in a container at room temperature. Do not seal the container as it may burst. Paint the mixture on tree trunks or wood. Apply daily as the mixture does evaporate. Looks for butterflies during the day and moths at night. It is astounding the number of moths that are attracted to the mixture. I've seen as many as 30 species mixed together feeding.